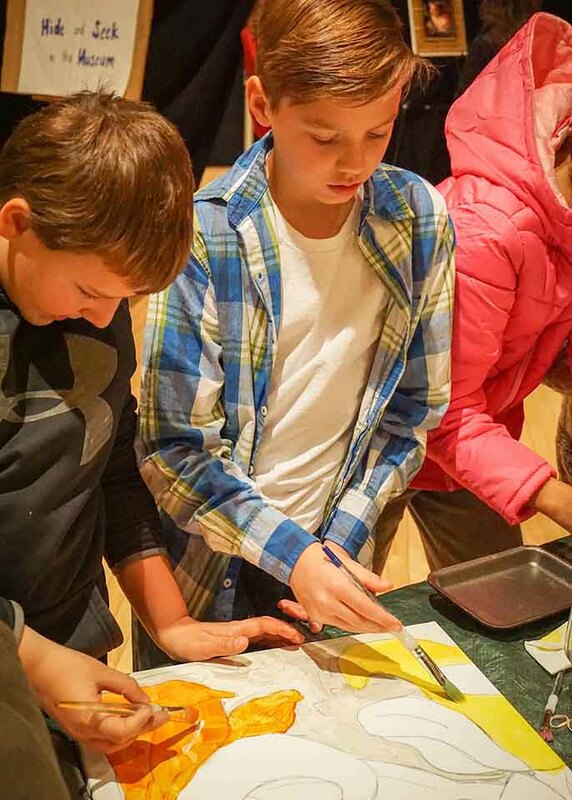 CES at Frostburg State University and the Evergreen Heritage Center (EHC) joined forces in November to present an exciting school day full of arts and science activities. The program, featuring educational activities in science, technology, engineering, arts and mathematics (STEAM) subjects, involved 80 fifth-grade students from Accident and Bel Air Elementary schools. The school-day event began when students arrived at the FSU campus to attend a CES performance of “From the Mixed-Up Files of Mrs. Basil E. Frankweiler” presented by the professional New York City-based theatre company, ArtsPower. Based on the Newbery Award-winning book by E.L. Konigsburg, the enchanting musical depicts a mysterious museum adventure surrounding a statue that may or may not be the work of Italian Renaissance artist Michelangelo. Following the performance, the children immersed themselves in Renaissance culture with a series of fun, hands-on learning experiences that reinforced the themes of the ArtsPower performance. The 90-minute Renaissance STEAM Fair, directed by Janice Keene of EHC, featured three educational stations. With “The Science Behind the Paint,” children learned about the paint used by Renaissance artists. Using traditional tools and methods, they worked in egg tempera to grind and mix dry pigment from natural minerals. The “Renaissance Inventions” station allowed children to learn about Leonardo Da Vinci and other masters who invented the printing press, parachute and hoisting gear. They then explored scenarios to create their own inventions. With “Hide and Seek in the Museum,” children experienced dance improvisation set to Renaissance music while exploring a museum-style setting. STEAM Fair teaching artists included Shelby Herbert of Mountain City Center for the Arts; Elaine Raesly, EHC Education director; Maggie Pratt, EHC Arts Education director; and EHC instructors Allison Boyd, Marta Fiscus and Sandra Salevsky. For more information, contact Susan Manger at smanger@frostburg.edu. The project was supported by the FSU Foundation, the Allegany Arts Council and the Evergreen Heritage Center Foundation. CES is supported by a grant from the Maryland State Arts Council. On the web at msac.org. CES is supported in part by the City of Frostburg. Local students learn about Renaissance painting at the STEAM Fair.